We reserved 110 rooms among the following hotels during the PQCrypto2016 and Winter School (check-in: February 21, check-out: February 27). Room blocks will be released after January 31, 2016 (17:00 JST). 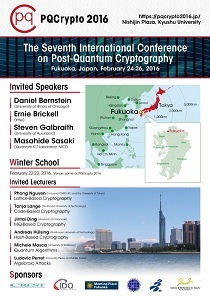 If you need a reservation for a room at the following hotels, please fill in the following form and submit it via email to (pqcrypto2016@conferenceservice.jp). Your reservation will be verified at a later date with the registration. We reserve the right to cancel unverified hotel reservations on December 10 in order to avoid misuse of this arrangement. Even if you do not need a reservation for the listed hotels, we strongly recommend that you make a hotel reservation as early as possible. Many Japanese universities will hold the entrance examinations in February, and you may have difficulty finding hotels at the last minute. Notification of cancellation must be made in writing (by email or fax) to the Conference Secretariat. Cancellations will be accepted until Sunday, January 31, 2016 (17:00 JST) without any penalties. After Sunday, January 31, 2016 (17:00 JST), you cannot cancel for any reason (cancellation fee of 100% of the booking value will be charged). The blue marker points at the conference venue, and the red markers - at the above hotels.